Yesterday was a very grey day here. It was raining when a package from Scout arrived. Honestly, when I opened it, the room immediately brightened! The colors were gorgeous! I grabbed it and took it with me to my Saturday morning knitting group for all to fondle and drool over. :) But I had to wait until today to take pictures of it, because, really, it needed a sunny day to show off properly. Isn't it gorgeous?! Scout and I did a trade: I knit her a custom Bauble (the pattern is on Knitty) and she sent me a skein of laceweight yarn and a small hot pink GoKnit pouch. I love them both! Thank you so much Scout! 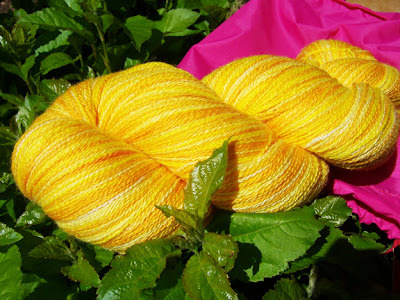 The yarn is 1,000 yards of laceweight Zephyr wool/silk in the Puesta del Sol colorway. It makes my heart sing. And it's just perfect for this month's Project Spectrum! Oh what a great shot of that!! Wow. What a great color! Wow, that color is amazing! Wow!! As soon as I opened your page, the sun shone through my PC's monitor! What an absolutely awesome colour - so very perfect for this time of year! This is going to be mere joy to knit with, I have no doubts about that! Beautiful! Oh God, and yellow is my favorite color. The way you placed it on the purple tissue and green. Yes, you are certainly an artist. Looks good enough to frame. Did I miss what pattern you are knitting with that gorgeous color? What a gorgeous sight on the millionth (okay, maybe not that bad) grey, crappy day here in Montréal. I think I'm in love with that yarn. Way to go, Scout! OMG! That yarn is beautiful! That's awesome. YOu definiely have enough to do a nice stole. 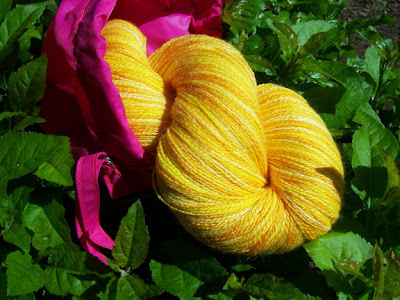 There are several in Victorian Lace today that would look beautiful with that yarn. What a great sunshiney color!